Recently I read one very interesting and useful e-book related to Search Engine Optimization. This really help me to learn a lot of concept about SEO. And also the tips are very useful to increase search engine ranking of your website. So here I am sharing the content of that e-book with you all. Hopefully this will also help you to increase your knowledge in Search Engine Optimization. This is the Part 2 of 4 articles – Links Are Queen. Content is King and Linking is Queen. Once you have created unique and original content, it is mandatory to create internal and external links to pages with targeted keywords. In this section we will discuss and present multiple linking strategies. Oftentimes link building is a very laborious project. External links are links that come from other URLs. External link should be built around targeted words. External linking is second only to content in importance. Search engines continually seek opportunities to ensure search results are accurate and specific. That’s just what searchers want. As an example, two competing sites may have the same link popularity and comparatively equal amounts of content. The only difference between the two sites is that one has relevant external links. The site with the relevant external links will get preferential treatment from the search engines. The most powerful links your site can receive are high page rank sites in your industry. Sites external to the industry add some weight but not as much as those focused on the industry. When receiving links it is best to have the words others are linking to you on match with the words of the page. Frequently you will provide someone giving you a link with an tag, like the example above. When giving an external link make sure it is pertinent to the contents of the pages you link to. Giving away too many external links dilutes your link power so give them sparingly. Steer clear of linking to inconsequential, blacklisted, or banned URLs. Notice the external link used in the red box in the left navigation area. 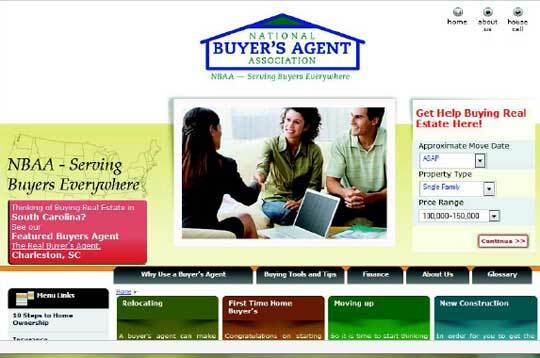 The National Buyers Agency Association (NBAA – www.buyersagent.com) features The Real Buyers Agent in Charleston, South Carolina. If you go to the NBAA site and click on that link, you will be sent to the home page for The Real Buyer’s Agent (www.charlestonhome.com). Great example of someone giving an external link to another site. Directories are search engines powered by human beings. Human editors compile all listings in a directory. Getting listed with the web’s key directories is very important as it results in many eyeballs seeing the listings. In addition, if you are listed with directories, crawler-based search engines are more likely to find your site and add it to their listings free of charge. Submittal to these directories is accomplished by providing a 25 words or less description of your entire web site. Usage of 2-3 keywords (you researched!) should be included in the description. This description must be written in natural language – no marketing hype. There are hundreds of directories that must be submitted to one-by-each. The two most notable and important are the Open Directory Project and Yahoo! Directory. Following are specific instructions about submitting to this directory. Use (a) the search engine or (b) the directory links to find the perfect category for your site. Look in the upper right-hand corner of the directory page for a text link that says, “add URL” and click on it. That’s the whole process. Following are tips for ensuring that you get each step right, which is harder for some people than many would guess. Step 2 is often a challenge. There is a tendency for Webmasters to think of their sites as being more comprehensive and useful than they really are, and thus to submit their sites to higher level categories than are appropriate. There is also a trend for Webmasters to search for the category that they think is most likely to be viewed by the type of customer they hope to attract, rather than searching for the category that best encompasses their website. For example, a Webmaster for a walk-in health clinic website is likely to submit his or her site to one of the hospitals categories, thinking that he or she will be doing the users a favor – helping them to find his or her clinic site when they’re “obviously searching for medical help.” You should not try to choose a category by anticipating how users will browse through the directory. The directory may not be perfect, and you may think that by submitting your site to one category over another that is clearly more appropriate will help the users of the directory, but don’t do it. That’s the job of the Open Directory Editors. Don’t look for a category where you think that your customers are going to search. Instead find the best branch in the DMOZ directory using logic. If your site sells jewelry made with amber, submit it to “Top: Shopping: Jewelry: Bead and Gemstone: Amber” and not to “Top: Shopping: Jewelry: Bead and Gemstone.” If you are not sure about a particular category, click on the link in the upper right hand corner of the page that says “Description” for a detailed description of the category parameters. Completing step 2 correctly will insure that your site is reviewed faster. If you submit your site to the wrong category, then the editor of that category is going to forward it to the right category, causing a delay in listing your site. As you can imagine, some sites are very difficult to categorize. If you’re not sure, submit to the category that you think is best and rely on the editors to do their jobs. Eventually the site will be properly indexed in the system. Step 4 includes several challenging elements, even for the geniuses among us. Correctly inserting the Title and Description for a website is often a challenge even for DMOZ editors. It can be a daunting task for people who are trained in marketing. When getting ready to write your title and description, it is helpful to think about the style of writing used in the instruction manual for your VCR. Notice that the instruction manual doesn’t talk about how great or innovative the system is – it just describes the system and explains how to use it. For some of us with a marketing background, describing a website without using marketing or promotional language can be nearly impossible to master. Marketing language and techniques seep into your very way of thinking. If you have a friend that works for a PR agency, you can test this theory. Just ask them about their worst client. They are likely to give you some good dirt on the company, but they’ll also tell you how terrific the company is at doing whatever the PR firm was hired to promote. They just can’t escape it, even years later. Let’s examine the Title requirement. As a rule, the title of a business website is the name of the business. The title of all other websites is the title listed on the site in question. The description, is the most difficult element in a DMOZ listing. There are basically two ways to learn to write a description for a site in DMOZ. The first way is to read all of the guidelines, assimilate the information, then follow them. The second way is to browse through the directory, looking at how sites are described in your category and in categories above and below your category, then imitate the style. Depending on your style of thinking, you may choose one way over the other. Determine if your site is already listed (visit Yahoo! Directory Help for assistance). Determine the appropriate category in the Yahoo! Directory. Suggest your site from the link on the Directory category page most relevant to your site (Non-English sites please refer to the list of Non-English Yahoo! Directories). From the front page, search on a term relevant to your site. From the web search results page, select the Directory tab under the search box. This will confine yoursearch to sites listed in the Yahoo! Directory. Under the search bar you will see a list of “RELATED DIRECTORY CATEGORIES” and relevant sitesfrom the Directory will be listed under “TOP 20 DIRECTORY RESULTS”. You can review the list of Directory categories related to your search term and you can see various categories listed under the description of each site listed in Directory Results. When you click on a category, you will go to that page in the Directory. You will see a “Suggest a Site” link located to the right of the search box on the Directory page. Note: If you try to click on “Suggest a Site” from a broad or top-level category, such as Education, Regional, or Entertainment, instead of browsing down to a more specific sub-category, you’ll be told that your suggestion is too broad. So make sure you search for and find the most specific category that describes the subject matter of your site. When you go to the appropriate commercial sub-category relevant to your site, you will see that the “Suggest a Site” links to the fee-based Yahoo! Directory Submit process –which is required when suggesting a commercial site. For more information please go to Yahoo! Directory Help. Writing press releases provides the opportunity for you to embed links to your big head or selected words. This sets the links up for others to grab the press release and distribute it to various servers. The distribution generates an abundance of links throughout the world-wide-web. Integral to your web strategy must be taking every opportunity possible to generate press and have it reviewed, linked, and submitted through an online news agency. This practice will give you great success and build links rapidly. We use PRweb.com. There are many automated tools available in internet to determine relevant sites for link building. This effort speeds up the process of sending link requests to websites. We are able to send 20 to 30 requests per hour for link building. We have observed from our past experience that if the page rank of our link page (not the home page) is 3, then 30 to 40% sites link back to us. If the page rank is 4 then, 40 to 50% sites link back to us. If the page rank is 5 then, 50 to 60% sites link back to us. Search in the internet. You will get access of thousands Article Websites. Many websites allow us to submit the article without sign up or user registration. Others require registration as a user for the submission of articles. Without signing up we can submit articles to about 20 sites. With a sign up procedure, you can submit articles to an additional 10 sites. Once the sign up is done further articles will be submitted at about 20 per hour. There are lots of RSS Feed submission and XML feed submission sites and you can submit to 15 – 20 sites per hour. Search in the internet. You will get access of thousands E-Directories. You can submit 15 to 20 sites per hour. Again search in the internet. You will get access of hundreds high-ranking search sites engines. You can submit 10 to 15 per hour. Create a feedback option or a forum, which propagates content and tends to generate linking. Create social network structure or a series of tools that will auto generate links as customers and consumers use the tool. One of the great successes companies such as Amazon, Ebay, and Eopinions have had is to use partners and vendors to link with. There are several levels of engagement in this scenario. Request, give incentive (place in contracts?) to all of your vendors and suppliers to put a link to your web site on their website. This is a manual process done on a relationship basis. Any of your vendors, distributors, suppliers, stores, or venues, with pages must link to your main site. Blogging is one of the most powerful tools you can use at the present. Ensure again that content is fresh, relevant, and unique. In terms of controlling the link building efforts on your site this method is second only to submitting your site to the directories. It is an effective way to give yourself links and get back links, get search traffic, and create fresh content. Blogging in this manner is a simple and cost-effective differentiation strategy. Linking to authority sites via a blog is important. Your bloggers should be deep linking to your site. As a general rule we strongly recommend not using link exchange programs, link farms, or any situation where you unnaturally obtain links. Google and the other search engines not only frown on this practice but in many instances will blacklist your site and remove you from the rankings. We are investigating a potential parallel link exchange and a three-way link exchange program. We will keep you advised on these. Create a page called links or references. All reciprocal linking you do is done on this page and it does not need to be a highly visible page. If someone links from their homepage to your homepage always link back to them from your homepage. If they link to you from an inner page, link back to them from an inner page. Know what the page rank is of the site that is linking to you. Don’t waste links on low page ranked sites. The more links on a page the more dilution. If someone gives you a link and they already have 20 links in a page, you are diluted 1/20th. If you are the only link, you get all of the page rank passed on. Check out how many links a page has before accepting it. Some links are good to accept, some are not. As a general rule do not accept a reciprocal link exchange with someone whose page rank is lower than yours. Link baiting is merely link building with a twist: Instead of hunting, bring links to your sites via relevant, unique, fresh, and popular site content. The music industry really lends itself to publishing pages or articles on hot topics that draw user attention. The idea is that others pick up on the content, it appeals to them, and they link to it. The article is the bait and the link is the catch. With link building there are five basic types of “hooks” or pages to encourage links: News, Opposing Opinion, Attack, Information, and Humor. Provide an easy mechanism and encourage others to pick up your content and put it on their web sites. A good example is the fan club. They pick up your content and photos. The ultimate link baiting is YouTube, MySpace, and Amazon. Give them a way to get to your video, news snippets, photos, great content, or some cool tool.